List of 6 healthy snacks for lose weight. With growing body weight today everyone is upset and in today's busy life,everyone does not have enough time to go to the gym and sweat for hours.Reducing weight is not a joke and for those people who are very fond to eat,today we are going to tell some healthy and tasty snacks in this article for lose weight.During weight loss,healthy foods and nutritious snacks are filled stomach for long time and do not feel hungry for long periods of time.We are telling you about some such healthy snacks here,which you can eat in weight loss. Roasted chickpeas contains a lot of protein and high carbohydrate but calories are very low.For more better results you can eat boiled chickpeas. Best option for weight loss.Smoothie is made from green vegetables like spinach,frozen mango,milk and linseed can make it healthier,nutritious and very effective in weight loss. It contains nutritious ingredients such as Vitamin E,magnesium,which are helpful in weight loss.Almond contains high amounts of fatty acids like Omega 9,Omega 6 and Omega 3.These are healthy fat which are beneficial for the body.Almonds contain unsaturated fat which prevents cardio vascular disease.Also,keeping blood sugar levels constant and not allow bad cholesterol to accumulate in the arteries. Oatmeal is the best choice for weightloss.It is full of beta glucon,soluble fiber which reduces hunger. It can be cooked in low fat milk and eat it.The biggest thing is that you can eat it in the breakfast as well as in dinner. Pista rich in protein and fiber which stimulate metabolism and are also beneficial in diabetes.Healthy fat in it increases the level of satiety and reduces hunger. Regular consumption of sprouts will reduce your weight.Sprouts rich in antioxidants,vitamins,minerals,proteins and fibers.These include iron,zinc,manganese,calcium,copper and niacin besides Vitamin A, B, E, C, which are very important for your better health. 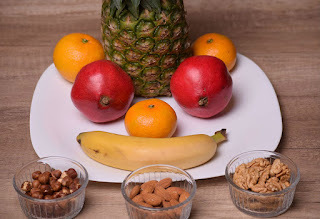 Healthy diet that you can use as breakfast,lunch and dinner as well as snacks.The most effective way to reduce excess fat in the body is to reduce the amount of cholesterol.By consuming it you can not only lose weight but also remove other diseases.